"Stupid, stupid… you’re such a dummy!" my father muttered to himself, over and over, as he paced the house. As a child, hearing my dad call himself names was unsettling. Now, as an adult with a child of my own, listening to him berate himself over a lost set of keys was eye-opening. His petulant ways long-ago earned him the family-nickname, "Uncle Grumpy.” He is unapologetic about embracing his inner curmudgeon. He is also a master at misplacing things, so it wasn't the first time I stood witness to his self-inflicted verbal lashings. However, it was the first time his words struck me as terribly sad, and I paused to consider the source of his degradation. Where did these callous remarks (which he has repeatedly characterized himself and others as) originate from? I don't believe we are born grumpy. Just as I don't believe people grow up to call themselves stupid without a bit of unconscious prompting from childhood. Did he hear it growing up? Did the people around him intentionally mean to hurt him or condition him to believe he was less than? Certainly not. I know most people do not willingly or knowingly choose to hurt their children. I realize most parents (like myself) who turn verbally aggressive do so out of unconscious habit, anger, fear, or because they are lacking the understanding, skills, and support to manage their emotions and behaviors. I know adults don't purposely intend to send the message to children they are unworthy, unlovable, or unwanted. However, this is what happens with every unconscious, punitive, or unkind act said or done in the name of "parenting." Our ill-considered discipline is historically laced with blame, shame, judgment, and guilt, and it communicates to our kids who we believe they are. Our home is supposed to be a safe haven from the intolerance of the world - a place where our identity is formed through the trust and intimacy shared within the family unit. Our words are a powerful foundation for children's growth and development. We have the choice to either lay a foundation which will pave the way for dependency, addiction, and disease or we can use discipline rooted in healthy intimate relationships, trust, and compassion. The latter will give our children the opportunity to reach their full potential. Not everyone who experiences verbal violence will fall prey to addiction or depression or lead a horrible life, but not everyone will be as lucky as my dad. He fell somewhere in the middle. His ambition, in my view, was never fully realized. I think he would have made an amazing history professor or a journalist, but instead, he retired early from a job he dreaded for years. But, who am I to say for sure? A child reared with blame will learn to avoid responsibility and decision-making. A child reared with boundaries and acceptance will learn to self-reflect and take action. A child reared with shame will learn love is earned and painful. A child reared with tolerance and compassion will learn pain is temporary and love is unconditional. A child reared with judgment will learn to condemn and coerce others. A child reared with curiosity and understanding will learn to consider others. A child reared with guilt will learn to depend on others to feel better. 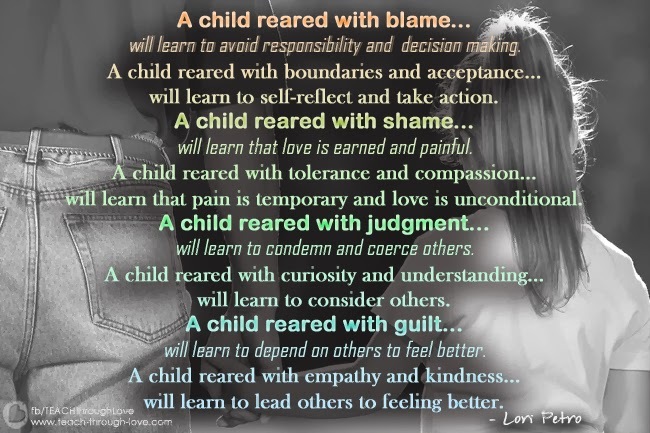 A child reared with empathy and kindness will learn to lead others to feel better. Your words matter. Please be kind. 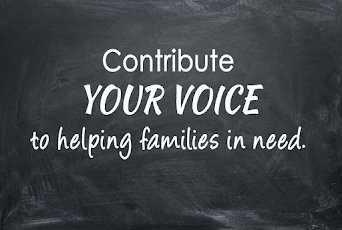 Are you willing to join our community in being more conscious of your words and actions? Leave me a comment below, and let me know how you are becoming more conscious! LIKE what you see? SHARE it with someone you LOVE! If you don't see the comments, try switching from mobile to desktop view. Why Supernanny is DEAD WRONG! Copyright 2006-2013 TEACH through Love. Simple theme. Powered by Blogger.